The Good Kind of Crazy: Blueberry Muffin Standoff! I've had a bag of Namaste Perfect Flour Blend in my cupboard for a few weeks unsure of what to make with it. Gluten free mixes can be tricky and I hate wasting entire batches of baked goods, so I avoided making anything with it. I LOVE Namaste Pancake & Waffle mix, which is why I trusted the brand enough to try their all purpose flour. 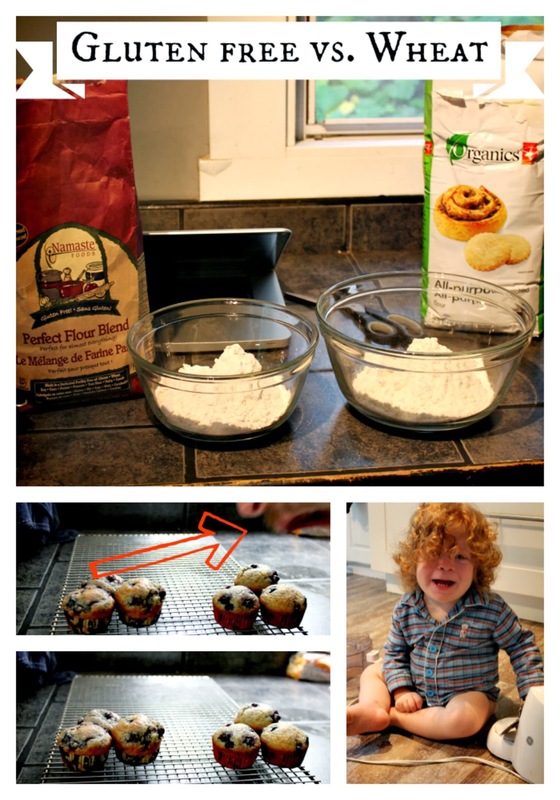 I wanted some easy snacks for school and for the kids so I decided to make muffins - and it hit me, time to pit flour against flour and have a muffin standoff. I'd like to take a moment to point out my husband's face trying to eat a muffin hands-free (he was actually just trying to ruin the photo - joke is on you sucker, I'm publishing the pic!) and my cooking partner playing with a mini food processor (blade removed) and emptying every drawer and cupboard in the kitchen! Preheat the oven to 375F and line muffin pan with paper liners. In a large bowl, stir together the flour, brown sugar, baking powder and salt. In a small bowl, whisk together the oil, milk, eggs and vanilla. Add the liquid ingredients to the dry ingredients and fold gently until almost combined; add the berries and stir just until blended. Divide the batter among the muffin cups. Bake for 20 minutes, or until golden and springy to the touch. Makes about 1 dozen muffins or 24 mini muffins (requires same bake time). The photo above shows the gluten free muffins on the left and the regular flour muffins on the right. I was shocked by how little difference there was between the muffins, and actually preferred the gluten free ones - they seemed less cake-y. The real test is that my kids ages 1,3,5,8,11 & 12 didn't notice the difference at all. Thumbs up to the all purpose gluten free mix! Next time I will make a control batch vs a vegan batch.... that should be interesting! My batter was way too thick. Is it really 1/3 c milk and 2 eggs? Yum!!! I decided to add a handful or two of shredded coconut and 10 drops lemon essential oil, split the sugar between brown and cane and they were divine!!! Thanks for giving me such a great base to play with.